Like for most people, The Wizard of Oz is a very special film for me. I spent a great many hours of my childhood (and, let’s face it, adulthood) enjoying the magical world of Oz and the splendor of Emerald City, feeling the oppression of Kansas and the joy of returning to it.1. The snow the wakes Dorothy up from the poppy field was 100% asbestos. Even though the health hazards had been known for years. 2. Only two of the Munchkins are heard using their real voices. The Munchkins, known as the “Singer Midgets” after their manager Leo Singer, were a troupe from Europe, most of whom used this film opportunity to escape the Nazis. Since most of them could not speak English or sing well, all of their voices were dubbed except for two: the two handing Dorothy flowers after she climbs into the carriage. 3. 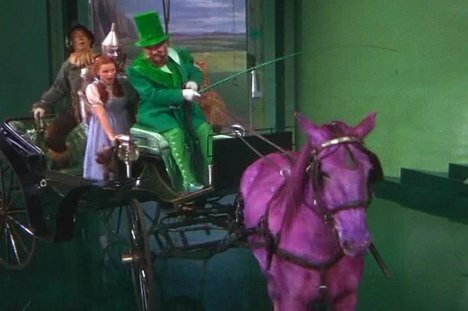 The “horse of a different color” was actually four horses powdered with lemon, cherry, and grape Jell-O crystals. The film was apparently not allowed to dye the horses various colors, so this was the next best thing. Four horses were used for the illusion of one color-changing animal, and someone had to stop each of them from licking the Jell-O off. 4. And that horse originally had a much larger part in the film. The horse, which was originally a striped with different colors and could speak, joined the Scarecrow, Tin Man, and Cowardly Lion, along with the Wizard, to save Dorothy from the Witch. 5. Professor Marvel, the fortune teller Dorothy visits when she tries to run away from home, never gives her back the photo of Aunt Em that she hands him. 6. Because Margaret Hamilton’s performance as the Wicked Witch of the West was so frightening, many of her scenes were trimmed or deleted entirely. They were thought to be too frightening. 7. When the wardrobe department was looking for a coat for Frank Morgan to wear, they accidentally found one of The Wonderful Wizard of Oz author L. Frank Baum’s! They were looking for an elegant coat that had “gone to seed” and had a feeling of “shabby gentility” when they purchased an entire rack from a secondhand store. One day, while filming, Morgan put his hand in the pocket of his coat and found a labeling indicating it had been made for Baum. After filming, the coat was returned to the author’s widow. 8. The Scarecrow’s face make-up consisted of a rubber prosthetic with a woven pattern designed to look like cloth; it left the lines of the pattern on actor Ray Bolger’s face. The lines took more than a year to disappear. 9. “Surrender Dorothy” was actually written in milk. The crew obtained a tank of water, a syringe, and a tiny model of a witch. The witch was attached to the edge of the needle, which was attached to the milk-filled syringe, which was lowered into the tank of the water. The words were then written backwards while filmed from below. 10. In order to look younger and, more specifically, flat-chested, Judy Garland had to wear a painful corset device around her torso. 12. “Over the Rainbow” almost didn’t make it into the final version of the film. The film endured a great deal of many cuts, including the famous Jitterbug scene, and “Over the Rainbow” was almost one of those cuts. Since the Kansas portion of the film was running a tad too long and didn’t seem geared toward their intended audience (children), and because it somehow seemed degrading for Judy Garland to sing in barnyard, the studio thought to cut it. Luckily, they kept it in the final version of the film. 13. They did cut a reprise of “Over the Rainbow” though. Later on in the film, when Dorothy is imprisoned in the Wicked Witch’s castle, she sings herself a reprise of the classic song in an attempt to remember Kansas. This version of the song made Garland and the crew cry because it was so sad. 14. Judy Garland tried to adopt Terry, the dog who played Toto. 15. The name of the head winged monkey is Nikko, which is also the name of the Japanese city where you can find the famous Hear No Evil/See No Evil/Speak No Evil monkey shrine. 16. The Munchkins were each only paid $50 for a 6-day work week, while Toto received $125 per week. 17. The make-up originally used to create the Tin Man contained aluminum dust that coated actor Buddy Ebsen’s lungs and caused him to have an allergic reaction. 18. Bert Lahr’s costume weighed over 90 pounds and was made of real lion skin. Naturally, it was very hot to wear. The studio was also very hot, which resulted in the actor sweating all day long. He would sweat so much, in fact, that two people were enlisted to dry the suit all night in between days of filming. Admittedly, the costume, which was rarely dry cleaned, didn’t smell good…at all. 19. The Wicked Witch’s smoke starts too soon in one scene, and when they reshot it, Hamilton was burned severely. So, the scene with the premature smoke appears in the film. The actress’ cape was caught in the platform when the flames roared, resulting in second- and third-degree burns on her hands and face. 20. And those burns required Hamilton’s green make-up to be cleaned out of them, which had to be done by rubbing a strong acetone against the burns, causing excruciating pain. 21. Before the directors were switched, Judy Garland’s Dorothy had enormous blonde hair and baby doll make-up.